This recipe inaugurates a new tag of “frugal food”, which seems appropriate in these credit-crunch times. 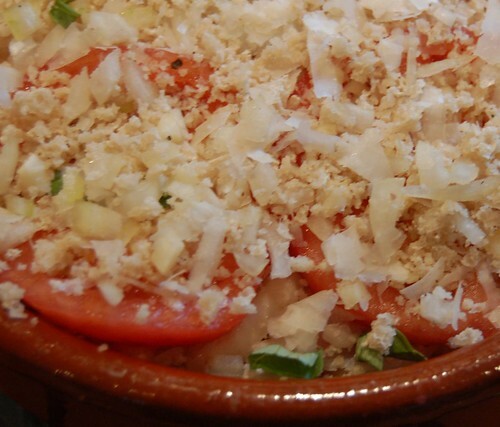 Made mainly of ripe tomatoes and stale bread, it costs almost nothing, and can make a light vegetarian main course along with a green vegetable or salad. Carnivores can have it as a substantial side dish with a roast — less meat needed! And of course I wouldn’t be posting it if it wasn’t delicious. The bottom layer of crumbs soaks up the juices, while the top is brown and crunchy. I habitually whiz stale ends of bread to crumbs in the blender and then store them in the freezer in ziploc bags, as they are useful for so many things. So I used some of those for this, and the last of the season’s tomatoes. It’s really best made with the ripest, reddest tomatoes you can find. If they’re a bit pale, up the garlic and herbs to compensate. Preheat the oven to 200C. Mix together crumbs, onions, garlic, Parmesan, lemon zest, and herbs, and season with salt and pepper. Use about a tbs of the oil to oil a gratin dish. Then sprinkle about a third of the bread mixture into it. Peel the tomatoes and slice them thickly. Lay half of them on top of the crumbs, season, and drizzle over about half the remaining oil. 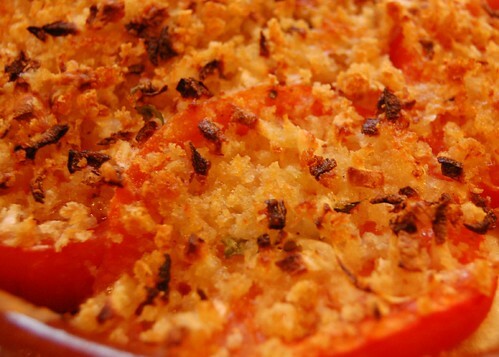 Repeat layers of crumbs and tomatoes, finishing with crumbs. Drizzle the remaining oil over the crumbs and then dot with butter. Bake for about 35 minutes, until crisp and brown on top. Wow, this looks really awesome! Is this a La Recette Du Jour original recipe? It’s quite an old recipe; I don’t know where it came from originally, but I found it in a book called The Big Red Book of Tomatoes by Lindsey Bareham (great when you have a glut of tomatoes!). I changed it a bit to make it more Mediterranean with the basil and lemon zest. This looks amazing, and I actually have all the ingredients! I’m going to try it soon. I’ve made it and it was delicious! Also the the Courgette, cheese, and herb tart is baking in my oven right now, it already smells good! 😉 Thank you for your amazing recipes!